The world is full of endless possibilities when it comes to finding crafts for kids ages 7 to 10. 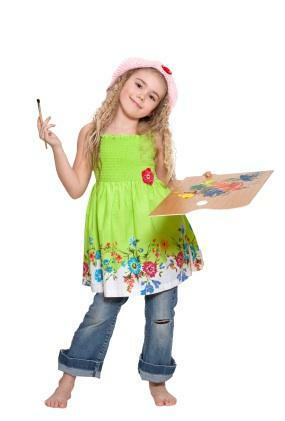 They can choose from an array of activities such as scrapbooking, model building, jewelry making and even tie-dying. This age group doesn't require as much supervision as younger children and can handle more complex crafts with detailed instructions. Have all materials available to complete the craft. Understand the directions before instructing your child. Protect your own and your child's clothing. Have enough room to work on the project. Provide supervision, but don't do the craft for the child. Don't suppress the creativity; if the craft is coming out differently than you expected, that's OK.
Keep the craft project age and, if necessary, gender appropriate. Make sure the project isn't too hard or too simple to complete. Be sure to praise your child for a job well done. Kids and crafts naturally go together, so it really doesn't take much to get kids interested and involved. You can purchase materials from a craft or dollar store, or save some money and use recycled items from around your house. You'd be amazed at what you can created from a few leftover pieces of wood, fabric, paper or even soda bottles. Scrapbooking and card-making are two great paper crafts for kids ages 7 to 10. They can create a memory book about their favorite school field trip or family holiday. Craft stores carry an abundance of scrapbook materials, so your child will have plenty of ideas from which to choose.